The IOC was too chicken to commemorate the Israeli athletes murdered in Munich, and the Lebanese managed to inconvenience people with their un-Olympic, unsporting judo training methods. And here’s a story about kaddish going to be said for the Munich athletes, outside the Olympics, this Friday/Saturday. Scroll down and follow the links for photographic proof. St. Joseph’s, Ravenna, NE, early 1900’s. A pretty small picture. St. Jarlath, Oakland, CA. Overhead picture of Mass in 1954 and church steps picture of female parishioners in 1921. St. Adalbert’s, South Bend, IN, 1927. Hats. 1929 front porch Mass, Reynoldston, NY. Hats. Overhead shot of a Mass in Massachusetts, 1930. Hats as far as the eye can see. 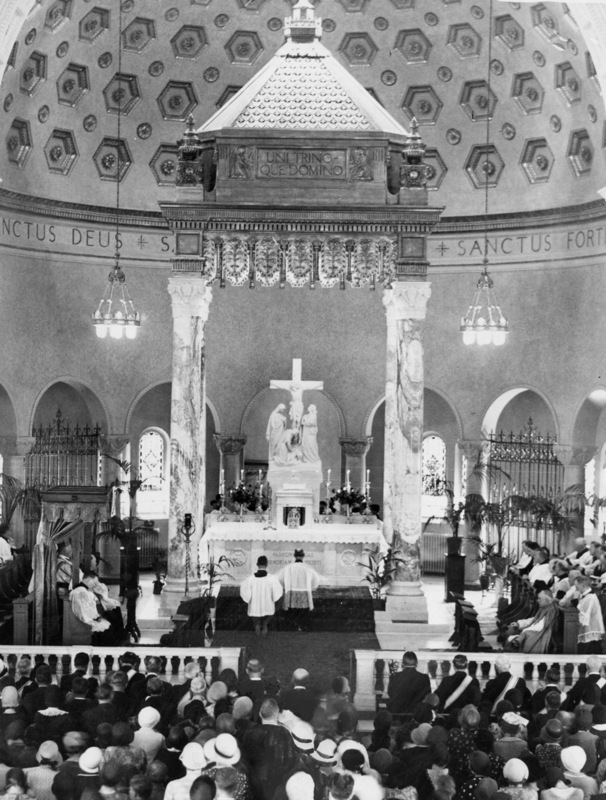 1942 Catholic Mass, Chicago IL. Kerchiefs and scarves. Looks like it was cold. A 1940’s Mass at St. Martha’s, Sarasota, FL. Hats. Nuptial Mass at St. John the Evangelist’s, Cambridge, MA. Pre-1956, but date unknown. Church steps picture from St. Joseph’s, Sturgeon Bay WI. Women in hats. “The Holy Communion”: Currier and Ives print. Shows French or Irish immigrants and a communion cloth. Women wearing cloaks. Another print, also called “The Holy Communion.” Looks like a nuptial Mass. Woman wearing bonnet. I keep grinding away at this. Yes. And I will keep on, until people realize the historical facts. In Italian, Portuguese, and Hispanic ethnic parishes (and Filipino, Japanese, and Korean ones, since they were heavily influenced by Hispanic missionaries), sure the ladies wore lace veils and even real mantillas. But in most of the US, pre-Vatican II Catholic women wore a wondrous variety of Sunday hats, sometimes augmented by kerchiefs, shawls, hairbows, and the like. Lace chapel veils (what most people mean by “mantilla”) didn’t become widely popular until the beehive hairdo. If you like ’em and wear ’em, that’s fine. If you think every Catholic woman should dress like a 1961 Jackie Kennedy reenactment society, you’re weirding me out. They are one little shard of Catholic tradition, not the Law and the Prophets. Bonus link: Treatise on the Catholic Mass showing Elizabethan women at Mass wearing “French hoods,” those little coif things. It’s a big church, so more than one Mass is going on at the same time. Illustrations of Penal times Masses in Ireland held in secret. Women in shawls and kerchiefs. UPDATE: I know it’s traditional to get testy during Lent on the Internet, folks, and I know we’re all sad and grumpy about the Pope’s resignation. But tone it down a tad. There’s nothing wrong with the whole veil thing per se. It’s the oversimplification and the misinformation I don’t like. People who are trying to be traditional should try to have a reasonable idea of what Catholic traditions are. There are an amazing number of urban legends about traditional practices, both from traditional and liberal Catholics (each of which has a vested interest) and from those in the middle or who don’t care (who you’d think would have less bias in the way). Oh, heck no. In general during this century, tiny babies and toddlers had bare or skirted legs (both sexes), little kids wore clothes thigh-length to above the knee (including boys wearing “short pants”), slightly older girls wore knee-length skirts, and girls hitting puberty wore skirts of various lengths below the knee, depending on fashion and practicality. (They “let down their skirts and put up their hair,” in many cases.) Sleeve length depended on weather and fashion also. 1929 First Holy Communion, Williamstown, Australia. Heh, I think somebody put on a growth spurt after the dress was made. First Holy Communion, 1930. Huge Thirties veil, knee-length dress. The Pulasky family, 1930. A longer Thirties dress for an older girl, as the fashion in hems moves down. Here’s a bunch of early 1940’s photos. In general, the Thirties and Forties were trying to save cloth, though not for fashion reasons as in the Twenties. So it’s a more austere look, but certainly not immodest. Marie Kenia, First Holy Communion in Duryea, PA, 1940. Sacred Heart Parish’s 1940 First Communion class. Sacred Heart Parish, 1942 First Communion class. 1942 St. Joseph’s Parish, Duryea PA, May Crowning. Note the saddle shoes and the hairbands. 1943 St. Joseph’s May Court, Duryea PA. Note the continued short sleeves, reasonable decolletage, etc. on these high school girls, who were more or less dressing like adult women. They are clearly wearing lipstick, so obviously their parents and pastor didn’t think makeup was evil. Short sleeves are perfectly appropriate for a humid Pennsylvania May, even on a formal dress. 1943 St. Joseph’s May Crowning: more flowers, less cloth, and V for Victory. Little kids’ classes on church steps, Sacred Heart Parish, Duryea PA, somewhere in the early Forties. Note the huge number of knees, and the fact that none of these kids are wearing pantaloons, slips, or such. Little girls didn’t need that stuff then, and they don’t need it now. (Yeah, I’ve run into some weird, weird modesty ideas on the Internet.) Here’s a little girl from Duryea dressed to the nines for First Communion. Note the crinolines bringing her dress out so that it falls right at the knee. First Communion (1940) and Confirmation (1962) pictures from Holy Spirit Parish, Little Falls, New York. This is from a parish of the schismatic Polish National Catholic Church, but it seems well in line with normal Polish Catholics of the time. Sacred Heart Parish, Duryea PA’s 1940 First Communion class. Note that while many girls do wear a First Communion “bridal veil” (possibly their mothers’ actual bridal veils, since they’re huge), the ones gathered around the priest use only a white hairbow as proper headcovering. Holy Rosary Parish, Duryea PA’s 1940 First Holy Communion or May Crowning Mass. Note the huge number of girls using a hairbow as their headcovering. Several girls are wearing a flower wreath, and another is wearing some kind of fascinator draped to one side of her head. There’s a tall girl sitting on a chair in the middle, wearing some kind of tiara without veiling — that’s why I think she’s the May Queen from this picture. Probably these were also the girls’ First Communion outfits, as it was traditional to wear said outfits several times at important Church processions and events during one’s First Communion year. 1948 First Holy Communion, St. Vincent de Paul Orphanage, LA. No veils at all, though all the girls have been provided tiara wreaths. A couple of First Communion girls in Karlsdorf, Yugoslavia, one wearing a tiara crown. St. Mary’s Catholic School, Millerville MN, 1951. Girls wearing First Communion beanies. 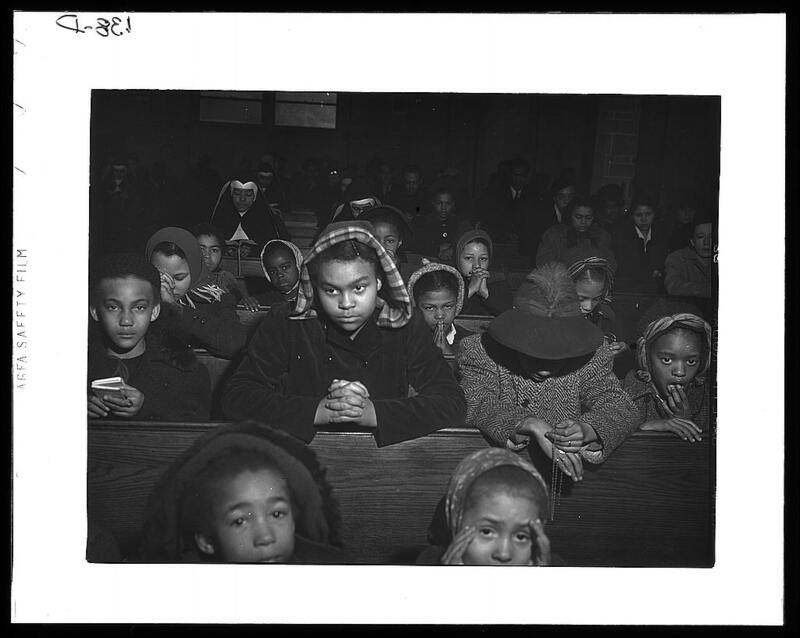 1942 Catholic Mass, Chicago IL. Girls wearing kerchiefs. Looks cold. Girl wearing flowers in her hair for First Holy Communion, New York sometime in the late Teens or early Twenties. 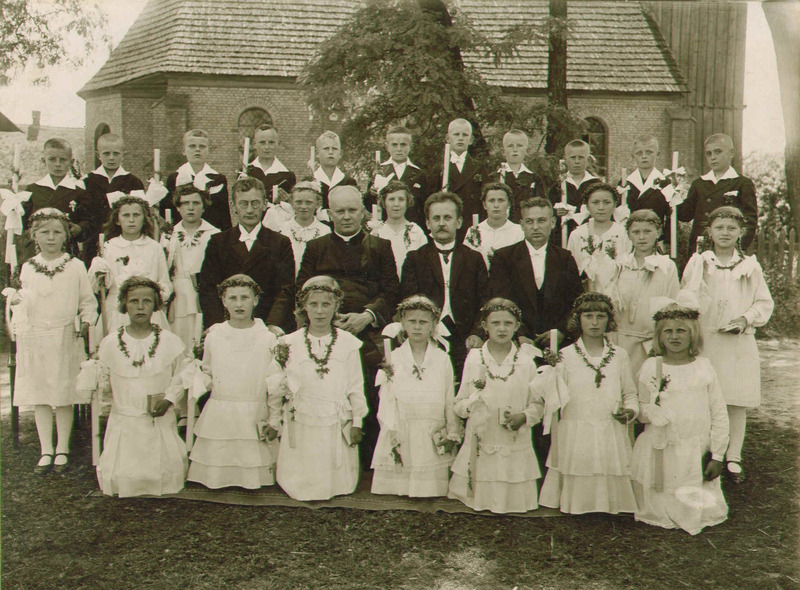 First Holy Communion at Wierzebaum, Germany in the late Twenties. Greenery/laurel wreaths and necklaces. There’s a great picture I’ve seen of First Holy Communion in a small Arizona parish in 1947, in which none of the kids are wearing special Communion clothes or veils, presumably because the money just wasn’t there. But the site seems to have gone away. Here’s a nice 1943 wedding picture of a Duryea PA girl (Catholic or not) who got married in her best dress, which happened to be green. Her wedding thing is the huge corsage (huge, but still more frugal than a wedding bouquet). Kayla Harrison speaks out, about how she came back from being sexually abused by her old judo coach back here in Ohio with the help of her new judo coaches in Boston. Also, the excruciating (and boring) detail of visualizing an Olympic day. A great look at the nitty-gritty of competitive sports on this level. UPDATE: WDTN talks about this part of the story. As I thought, the local news outlets were all protecting Harrison’s identity at the time, since she was both a victim and a minor, and only brought up the story when Harrison did. The arrest of her coach, I had heard about, because his identity wasn’t up for protection. The Christian Science Monitor asks, with exasperation, whether we can now remember Kim Rhode. Considering that she’s won 5 medals in 5 Olympics. Sporting News notes that she has outdone Mark Spitz, Wilma Rudolph, and other Olympic greats. The only people ever doing this before were a Japanese judo champ and a couple of German luge guys. Other than a gun donated by fellow shooters after hers was stolen, she and her husband (Mark Harryman — she kept her maiden name for competition) fund her Olympics training all by themselves. Good Mass at the Festival this year. Still had stepdancing to fill time while passing the hat at the offertory, but that part was done fairly solemnly. Other than that, no weirdness and lots of prayerfulness, and a good homily to boot. Anyway, one of the bands (Finvarra’s Wren from the Detroit area) covered a wonderful song I’d never heard before: “Sister Clarissa” by Michael Smith, from his 1988 album Love Stories. An extremely touching song about parochial school and the teachers who were women religious. This is by the same guy who wrote “The Dutchman,” but I think it’s clear that this is the superior song. (Possibly even the Mother Superior song.) Anybody who can turn the Baltimore Catechism into a song chorus — with absolutely no mockery or irony, just honest presentation — is a darned good songwriter. It was just four years ago that Bishop Salvatore Cordileone attended the Church Music Association of America’s annual Colloquium and celebrated a solemn Vespers for us. Now he’s going to be the Archbishop of San Francisco. I think he’ll be a darned good bishop.